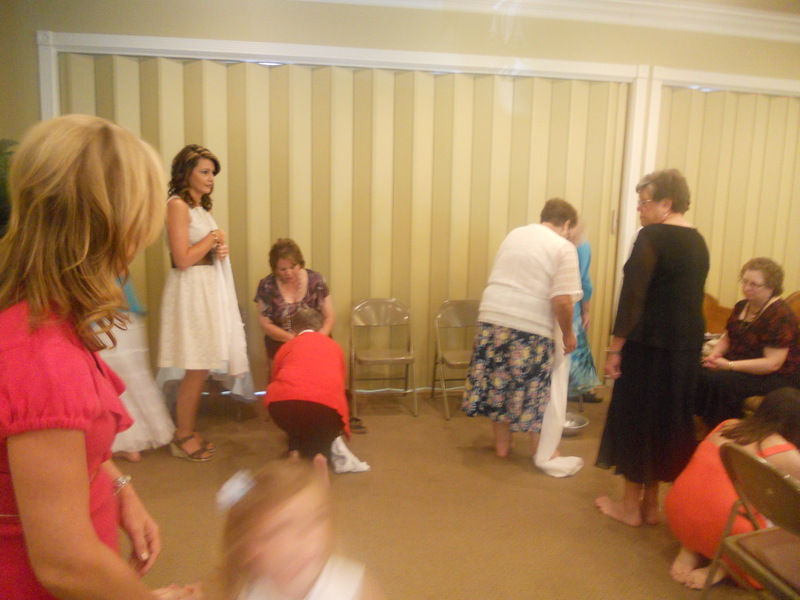 Communion was in the morning time this year and was blessed as brothers and sisters washed each others feet and comprised of mothers and daughters washing each others’ feet as well as fathers and sons. We surely should all be down at the feet of one another all the time ( in a spiritual way) and not just during a Communion service. Pray that 2013 meeting will also be blessed. 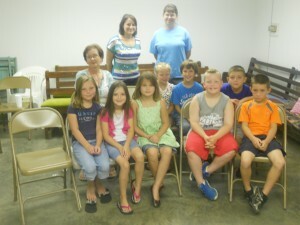 We were blessed to have a 3 day Singing School June 18-20. Attendance was light but we trust it was beneficial for all who attended. Thanks to Bro. Phillip Green and all the teachers who helped make it possible. Make a joyful noise unto the Lord and come before His presence with singing said the Psalmist in Psalms 100. 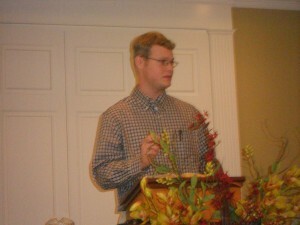 We were blessed with a great spiritual annual meeting the 2nd weekend in September with Elder Ben Winslett from Huntsville, Al. 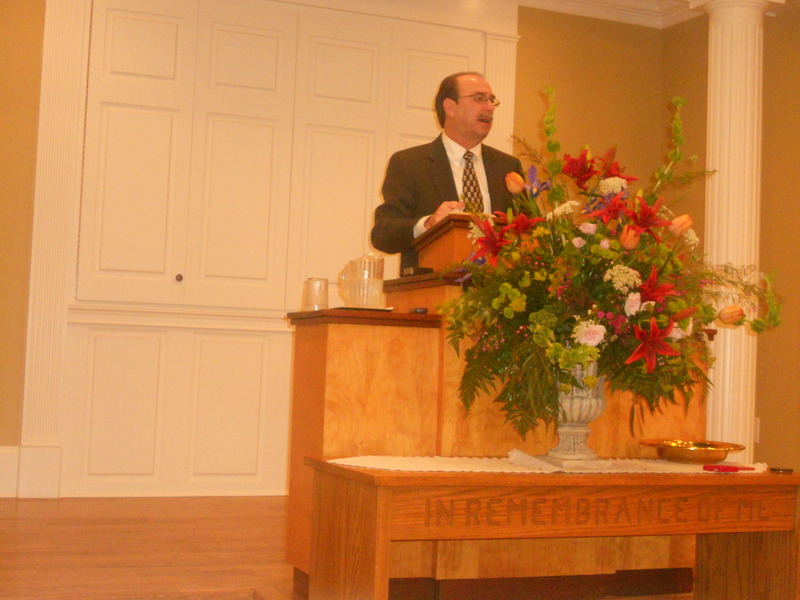 He delivered 4 messages entitled “The Superiority of Christ”, “Being a Primitive Baptist on Purpose”, “The Ministry of The Church”, and “I am Not Ashamed”. The meeting was well attended from sister churches and friends and a great blessing received. “I was glad when they said unto me, let us go into the house of the Lord.” (Psalm 122:1). Brother Jonathan Wise started introducing services some time during September and he was blessed from the start to deliver some timely lessons. The church body has enjoyed his efforts in bringing the Word of God and we pray He will continue to be blessed. Brother Jonathan’s brother, Brother David Wise was blessed to pass the final and fourth part of his CPA exam in August and he will receive his official license after a year of working under the supervision of a CPA firm. He is working with Watkins, Ward, Stafford, CPA’s out of Pontotoc, MS. 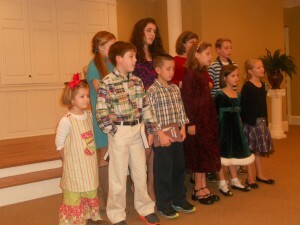 Sister Tammie Wise’s daughter, Caleigh Coleman, came forward on October 21 desiring baptism and a home in the church. 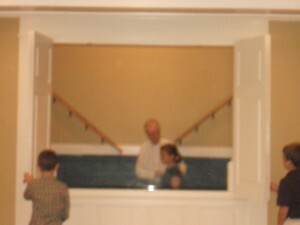 She was joyfully received and baptized on October 28, 2012. We trust the Lord will bless her to be loyal and faithful, along with the rest of our members. We were also blessed to have the return of Sister Brittany Bonds Houston who desired to be reinstated as a member of the church. She was joyously received back into full fellowship and we are delighted to see her, her husband Andy, and daughter, Maggie, in church. We miss them as well as everyone when they are not there. Sister Emma Kate Wise won the Miss North Pontotoc Beauty Pageant for the 7-th through ninth grade. She was very beautiful in this pageant as well as always. Sister Paige Wise was named teacher of the month during September. She has labored hard this year and last and it has finally payed off. Endurance does finally produce its rewards. We were blessed with one of the best Christmas Singings we have had in recent years on 2nd Sunday night in December s the church house was almost full and the singing was wonderful. The Spirit was filling the house. Everyone was sad to see it end so soon. We’ve had great comments on the blessings enjoyed during this time of singing and fellowship during the following meal. Everyone enjoyed the gathering of the church family to assemble the Christmas fruit baskets on December 16. Twenty Nine fruit baskets were assembled and later delivered and the recipients were very appreciative for the baskets, but I think more important than that was the love and sentiment behind the baskets. The pizza lunch afterward was also enjoyed by all. As always seems like, there was some sadness during the year as a few in the community passed away to be with the Lord. Sister Sandra Wise’s father was diagnosed with lung cancer and he went through twenty plus radiation treatments and the prognosis is still uncertain. Sister Tammie Wise is still cancer free after a scare with a lung infection. Sister Nancy Waldo also continues to be cancer free as well as Brother Terry Wise after a recent annual evaluation. We were blessed to have the Huddleston family from Falkner, Ms start attending our church and they seem to be enjoying the services and we pray the Lord will bless more to find our church and desire to attend on a regular basis.